Introduction: Totally edentulous patients require a specific approach to prosthetic treatment, due to presence of excessive bone resorption, painful neurogenic spots and thin mucosa. One possible approach to treatment is application of complete dentures, lined with elastic materials. The porous structure of these materials is a prerequisite for bacterial and fungal colonization in oral cavity. The saliva flow, through its cleansing and antibacterial action, partly regulates this process due to the presence of histidine-rich peptides, peroxidase system, lysozyme, lactoferrin, slgA etc. Aim: Investigation of the relation between sIgA or LF levels and the type and amount of Candida spp. in saliva of totally edentulous patients, treated with conventional and two-layer complete dentures. 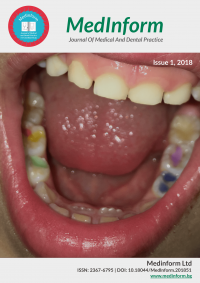 Material and methods: 43 totally edentulous patients at the average age of 68.4 ± 9.94 years were treated with conventional complete dentures and with complete dentures, lined with silicone-based elastic materials. In relation to Candida spp. presence in the saliva, the patients were divided into three groups, as follows: without Candida presence, with norm/light presence and with moderate/heavy presence of Candida spp. The salivary levels of LF, sIgA, and the amount and type of Candida spp. were examined before and after prosthetic treatment. Results: We found dependence between LF levels and the type and amount of Candida spp. in saliva. The increase of LF concentration was established in the presence of non-albicans Candida and in the presence of Candida spp in levels below and above 104 CFU/ml in saliva. Such dependence at sIgA levels was not detected. Conclusion: Despite the major role of sIgA in the mucosal immune system, its levels were not dependent on the type and amount of Candida spp. in saliva, unlike those of LF.